You will see why I collect Source/DatabaseID twice later on. Of course I used a lightweight Server-Trace, although for the purpose of this comparison it would not have mattered. 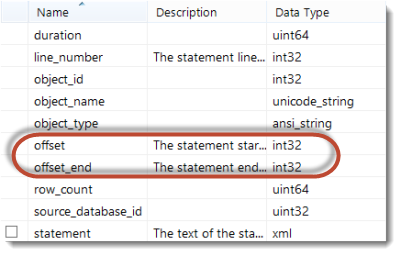 Those two columns are not available for SP_Staring/SP:Completed in SQL Trace. 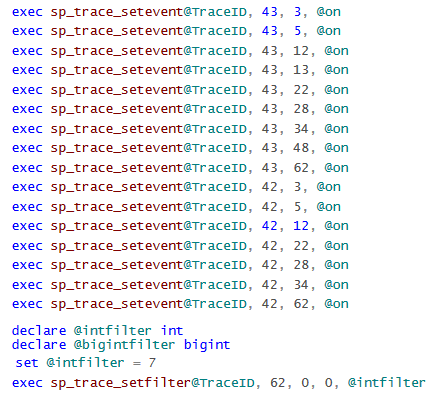 Since they are both integers, I decided to include another column, DatabaseID, into the SQLTrace. SQL Trace also includes the SPID by default, which cannot be deselected, therefore those two columns should equalize it. Both traces were started before the workload which ran for a while. At the end, the same number of events have been logged by both technologies in parallel. Keep in mind that this post is purely on comparing file sizes, and not performance or features. There are good reasons that SQL Trace & Profiler have been deprecated, and Extended Events in SQL Server 2012 overcomes SQL Trace & Profiler by far, in performance as well as in flexibility/usability. For a performance overhead comparison check out my recently published benchmark blog post: “Performance overhead of tracing with Extended Event targets vs SQL Trace under CPU Load“. So whenever performance matters, remember to set session options appropriately and if the amount of events is high, do not use your slowest volume for the file target – same as for all other tracing activities anyways. Conferences 2013: Frankfurt Database Days and a couple of “Oracle-Moments... Survey: Which Tracing and Analysis-Tools do you use for SQL Server?